The APS Transportation Department is responsible for the safe and timely transportation of students attending Arlington Public Schools. Free school bus transportation is provided to and from school for students living beyond a 1-mile walking distance from elementary schools and a 1.5-miles walking distance from middle and high schools. There are also links to several documents related to transportation, including an official policy document titled "Transportation," published in November 2005. Almost none of the official documentation one finds on the web site deals with anything beyond how the buses are operated and who is eligible to ride them. Another document encouragingly titled "Transportation Demand Management" is barely better than hand waving and hardly even qualifies as a policy. Just a few words like "Staff are encouraged. . ." and "students are encouraged. . ." show up. This is good, but I was unable to find any information on actual implementation efforts to make this encouragement effective. 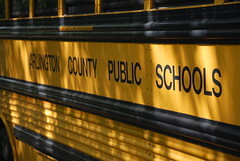 Essentially the transportation plan for Arlington Public Schools is a bus plan and little else. In the 21st century, a mid-20th century school bus plan is insufficient. A good transportation plan should address the transportation system as a whole and every student's transportation mode, whether it's bus, bike, skateboard, car or shoes. It should address issues of traffic, environment, and even land use. The plan should measure and manage transportation across all the modes. A comprehensive plan should look forward in time, set goals and put in place strategies to meet those goals. Those are all things that Arlington County has decades of experience with. The County transportation department is often held up as a national model for how jurisdictions should develop and implement long term transportation plans. At least 40 years ago the county was already planning for transportation and land use in the Rosslyn-Ballston corridor. Arlington has effectively managed enormous growth in commercial development and multi-family residential development with virtually no increase in traffic for several decades. So let's get these people together. It's time for the schools to call the County and request their expertise in developing a real, 21st-century transportation plan. Insiders in the county government tell me they would welcome the opportunity to help.